That is the day I realized I was different from everyone else. 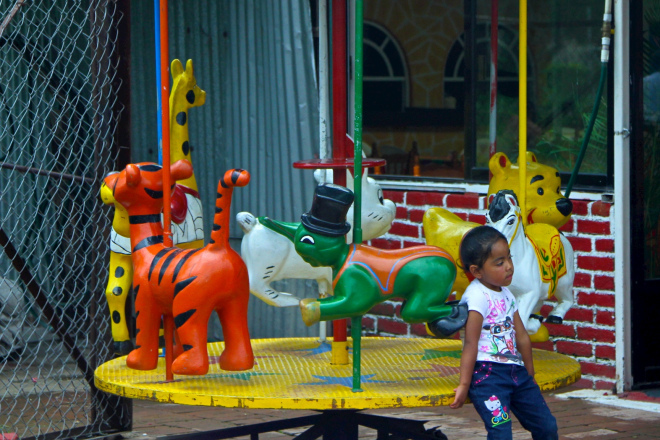 I remember sitting on the merry-go-round across the street in daycare wondering why me? I spent a lot of time on the broken ride watching the other kids run around playing tag, kick ball, trying to make hoops in the too high basket. They didn’t want to play with me anymore. A month ago, by accident, I let my secret out. I didn’t mean to. Mommy said that there are others out there like me, but not to tell my friends because they wouldn’t understand. Why would my friends abandon me for something that I didn’t have any control over? It didn’t make any sense. I stuck by Tommy when he sneezed in the library and got snot on his book and everyone called him snotty Tommy for a week. Okay so this is what happened. Me, Tommy and Annabel were playing hopscotch. Katie and Greg were yelling at each about the rules to a game they’d made up. They always make up games and they always spend most of playground time fighting about the rules. Billy as usual swung high on a swing. Raymond and Mark were teeter-tottering. I threw the rock into square three and was about to hop into one when Cornelius appeared. I mean literally… appeared. He’d been appearing to me for as long as I can remember. This wasn’t a normal visit. Cornelius looked very upset. He kept pointing at Billy. I saw a terrible sight in my head and started screaming. I yelled at Billy to get off the swing and go inside. I screamed at everyone to go inside. Ms. Cane stomped toward me. She would take me inside and Billy would get hurt, really hurt or die. I ran to Billy’s favorite action figure leaning against the fence, grabbed it and ran toward the door. Billy jumped off the swing and ran after me. All the other kids and teachers ran after me, following me into the cafeteria. That’s when the big boom came. A loud crashing sound that hurt my ears. Everyone froze. I ran to the window and saw a car on fire with part of the swing set inside the front window. Cornelius Appeared again, just outside the window I glared out from. He looked so happy, jumping up and down clapping his hands doing our funny dance. I laughed and starting dancing along with him. That’s when everyone tore their eyes away from the sounds of glass breaking outside to gape at me. “Cornelius saved Billy’s life,” I blurted out. Ms. Cane ushered us into another room, further from the playground. Sirens drowned out the roar of fire. Ms. Cane pulled me aside and asked me who Cornelius was. I told her he was my imaginary friend. I also said that he showed me what would’ve happened if I didn’t get Billy off the swing set. Mark called out to the others that I had an imaginary friend and all the kids started to laugh. Ms. Cane shushed him. I said all I could say. “You’re welcome.” And ate my cookie.